On the Eleventh Day of Christmas my true love gave to me . . . There are always lists when we visit California. We dream about it all year, our favorites and new spots we will go TO EAT. There are also the dishes we will make – for family and of course, New Years. I have high on my list (but Jac wishes they’d just go away. . . ) pasties while he requests Uncle Bert Enchiladas. His wish came true this week. It almost did Philip in – he heard we were having enchiladas and rejoiced but on finding out they weren’t our enchiladas, he very nearly had a break down. He rallied though and consented to just a few ingredients on his plate. Meanwhile, the girls were eager to help with Tess offering to do anything and everything and Ellie being quality control. She’s very good at taste testing. Anyway, Uncle Bert enchiladas. We call them that because it was Uncle Bert who made them for us, passing down what his mother had taught him. He claimed she learned how to make them in New Mexico, where her brother lived. It has never really mattered to me because 1. they (the enchiladas that is) are weird and 2. not my cup of tea. Actually, I was rather embarrassed and nervous to introduce my Mexican boyfirend to my decidedly gringo side of the family’s odd entree. “They’re flat.” he pointed out. “When do you roll them?” He seemed less than impressed that first time, but since then he’s become my husband and somewhere along the way, a fan of “the” enchiladas. All I can say about that is that Uncle Bert would be proud. *Daniel family additions. No Mexican or pseudo-Mexican meal is complete without these ingredients. Uncle Bert was an Engineer through and through so the “building” of the enchiladas was a science and work of art all at once. We continue to try and retain what he taught us about balance and order while attempting to take it all to a new level. In order for the enchiladas to come together right, the cold ingredients should be cold and the hot, um hot. Three of your four stove burners should be on and cooking while the final one holds the plate of greasy – I mean cooked – tortillas. Heat the sauce until simmering, keep the burger warm and get to frying the tortillas. They should bubble and float and then be flipped, but heaven forbid! do NOT let them get crispy! Take your hot tortilla and submerge it in the enchilada sauce. Then, lay it flat on a warm plate. (Sorry. I forgot to mention you should have your oven on, too, to warm the plates. Maybe I don’t like these because it’s so freaking hot in the kitchen . . . ) Spread a large spoonful of the beef on the tortilla. Sprinkle on some cheese, a little onion, some tomatoes and whatever else you like (I don’t like wilty lettuce so I leave that for the top.) and then repeat the process by dunking a tortilla and laying it ON TOP of what you just did. Yes. We are stacking here. Real men (and ladies with hair on their chest) do a stack of three tortillas and fillings. (I only do two, but do what you want.) Then, then, – and this is where things get crazy! – you top it all off with a fried egg and a generous ladle of sauce over it all. Get back, Jack! I did so just say that an egg – crispy on the edges and runny yolked – is the crowning glory of these masterpieces. Don’t knock it till you try it. Just ask Jac. But not Tess. She has yet to try them. She was just the waitress here. 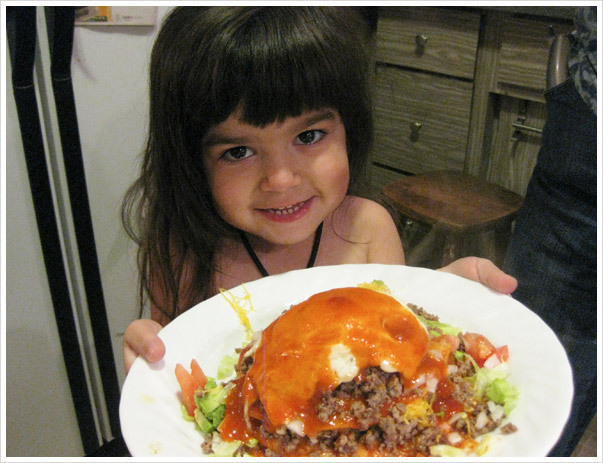 My hubby loves Uncle Bob enchiladas whenever I make them – the egg is the best part! A friend of ours makes similar stacked enchiladas but had never tried the egg. Now their family has adapted their enchiladas to include the greasy, yolk-filled topping.